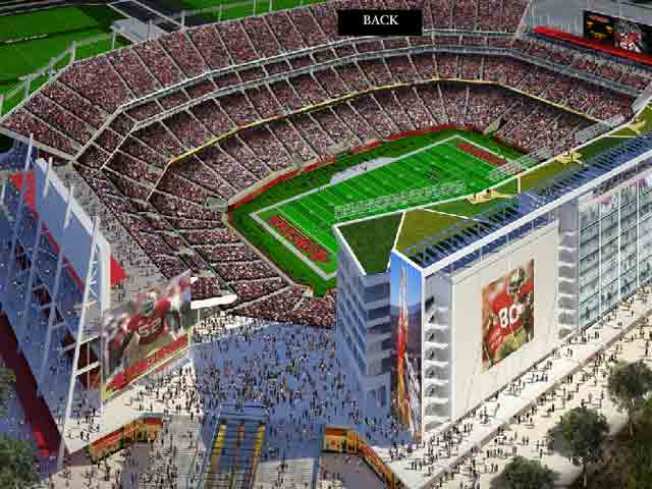 A rendering of the 49ers new Santa Clara stadium. The San Francisco 49ers have already sold three-quarters of the seats at its new Silicon Valley stadium, thanks in part to the team's Super Bowl run. The 49ers said Friday that fans and corporations have bought $403 million worth of tickets at the Santa Clara stadium that's set to open next year, when the team leaves Candlestick Park in San Francisco. The new $1.2 billion stadium requires fans to buy seats that cost between $2,000 and $80,000, then purchase season tickets that cost $850 to $3,750 each year. The most expensive seats in the 68,500-seat stadium have already sold out. The San Jose Mercury News reports tickets sold steadily throughout the NFL season and jumped when the 49ers reached the Super Bowl, which they lost to the Baltimore Ravens.